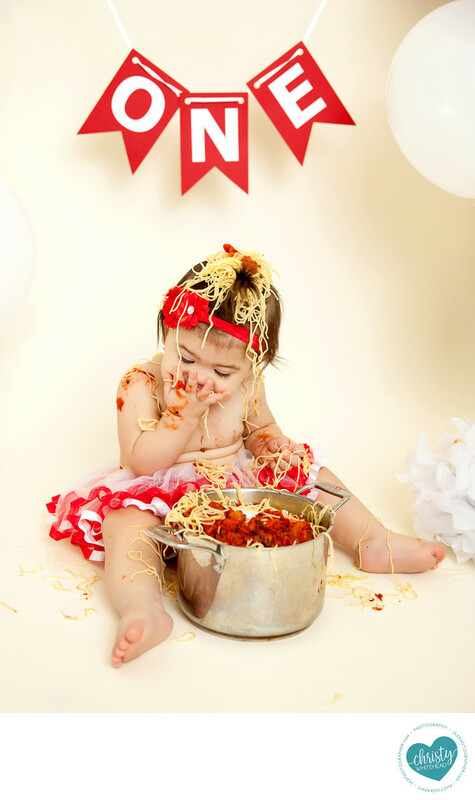 The cake smash has been gaining in popularity recently as a way to celebrate and document baby turning 1! While it's fun, there are some really great alternatives to the cake smash that don't have the negatives associated with a cake smash. Suprisingly, most babies usually hate the stickyness of cake and the sugar can be an overwhelming shock to their system. Food that your little one already loves to eat like, spaghetti, is a MUCH better time (and healthier too!). This sweet little girl actually cried when we took the spaghetti away from her. The food can be something that is culturally important to you, perhaps it was babies first "real" meal, a food that you eat often, or it can be something totally random and fun. Nearly anything can be turned into a "smash" style session. Feel free to look through the gallery for examples and reach out if you would like to book your babies first birthday smash at the studio.